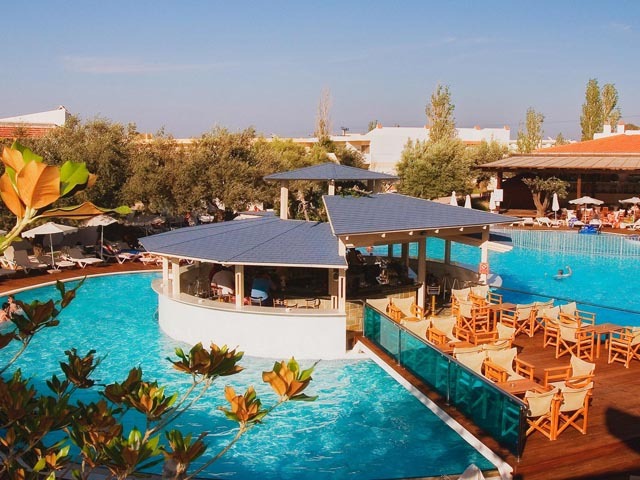 Consists of 3 different areas: Relax, Activity and Deluxe Area, each with its unique facilities designed to offer the ideal holiday experience to all. Basic accomodation : All rooms have satellite LCD TV, direct dial phone, wired internet access (free of charge), Safe box (at extra charge), Mini-Fridge, air conditioning, Bathroom with bathtub, separate shower cabin, WC, Hair-dryer. 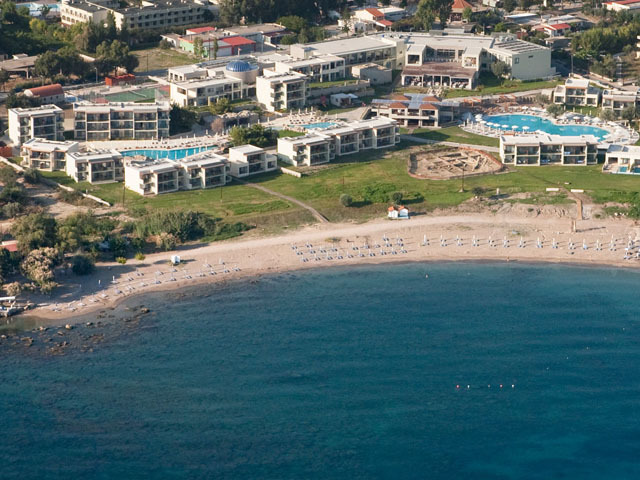 Basic Accommodation Plus : 2 Queen size beds (permanent), swim up, Balcony with sun loungers, Ground Floor only. * Double rooms with two queen beds do not have partition. Basic accomodation plus: 2 Queen size beds (permanent), Balcony with pool view. *Double rooms with two queen beds do not have partition. Basic accommodation plus: 2 queen size beds (permanent), Extra chair bed (not permanent). *Family rooms with max occupancy 5 persons are only located on the ist floor. 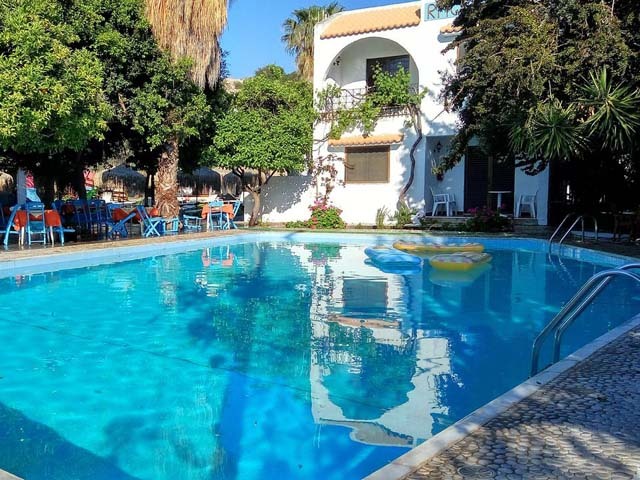 **Family rooms with max occupancy 5 persons do not have partition. ***Family rooms can not be adjoining with double rooms. Highly trained entertainers offering an exciting and diverse range of shows, fun and activities. This includes theme and party nights, pop shows, bingo. Children's entertainment, cabaret, karaoke and colorful shows. Live music, live shows and cinema. Note: Some facilities are subject to weather permitting High Ropes is a course exclusively operated by a tour operator. Age and weight restrictions apply and fluent English are requested for the tuition. Participation is also subject to availability. 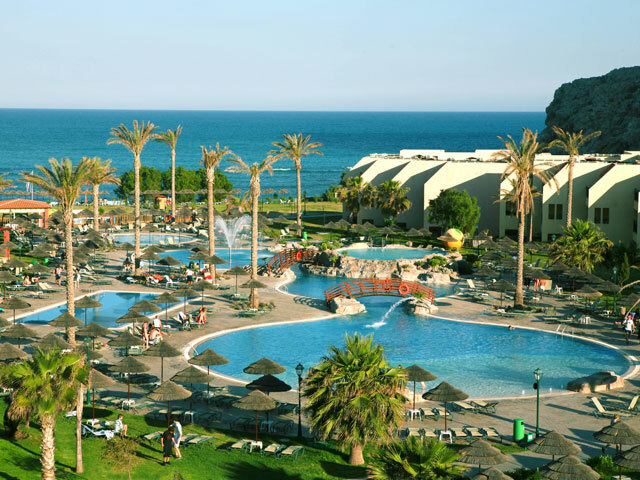 Family holidays at Atlantica Holiday Village Rhodes means a lot of fun for your little ones. Baby's corner in main restaurant with microwave oven, boiler, bottle warmer etc. Discover the tastes from around the world in the olive chef’s market restaurant, serving English and International themed hot and cold buffet. * Kindly note that gentlemen are required to wear long trousers for dinner. ** Kindly note that gentlemen are required to wear long trousers for dinner. * The Greek & Grill A La Carte, which serves the finest quality Greek cuisine, cooked in a traditional Greek manner by our own Greek chefs. Located in the main building at the activity area, Atrium Bar is the ideal place to meet with your family & friends. Serving hot, cold & alcoholic beverages. The perfect location to catch up with all the sports and relax with a cold drink. "Cantina - Deli Cafe Pool and Entertainment Bar"
Serving cold snacks and a wide selection of beverages and cocktails. 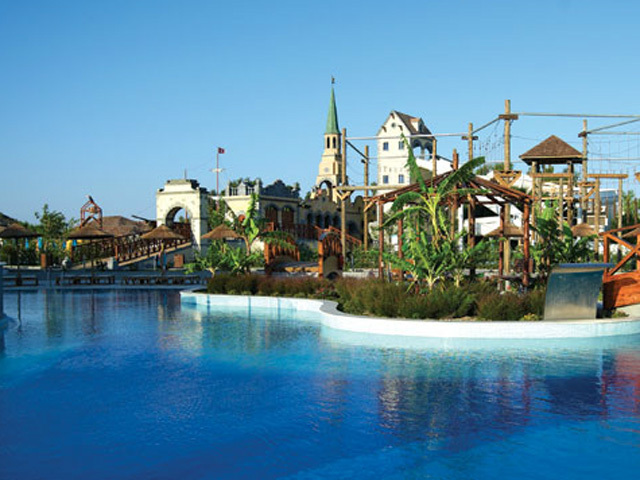 Enjoy your snack or drink, while relaxing during the day, next to our Water Park or at night while watching our shows. Cantina - Deli Cafe Pool and Entertainment Bar is located near to the main stage, within the Activity Area. Swim up to the bar and enjoy a well deserved refreshment or a cold snack. Located within the pool in the relax area. "Cosmopolitan Restaurant (Deluxe Guests Only)"
Serving an upgraded continental/hot breakfast and in the evening an International themed dining. Situated within the Royal Deluxe Area and is included for Deluxe guests or is available at a supplement for guests staying in the other areas of the hotel. *Kindly note that gentlemen are required to wear long trousers for dinner. Exclusive for adults this bar offers a quiet relaxed atmosphere located within the Deluxe Area. Located within the pool are of the Deluxe section of the hotel. Offering cold snacks.